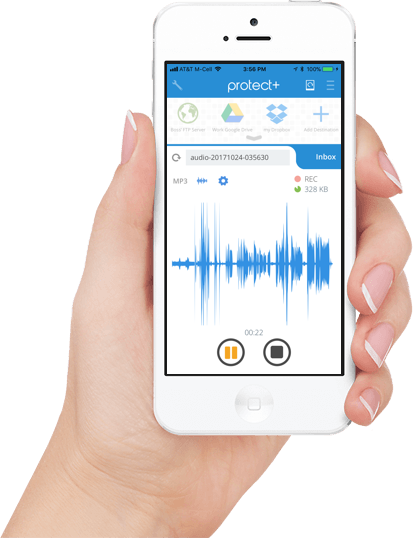 Protect+ Voice Recorder with Encryption is a full-featured audio/voice recording app with a simple, elegant interface. Whether you're a doctor, lawyer, or student... or in business or the media... or anyone who needs to record or dictate voice or other audio, finally there is a solution that makes recording, encrypting and uploading those important files quick and easy. High-grade encryption for your critical audio recordings. Record to MP3 or WAV. Upload or send files with powerful 256-bit AES encryption. Timed auto-stop, gain control, auto-skip periods of silence, and more. Send your files to iCloud, Dropbox, FTP, Google Drive, Email, and more.